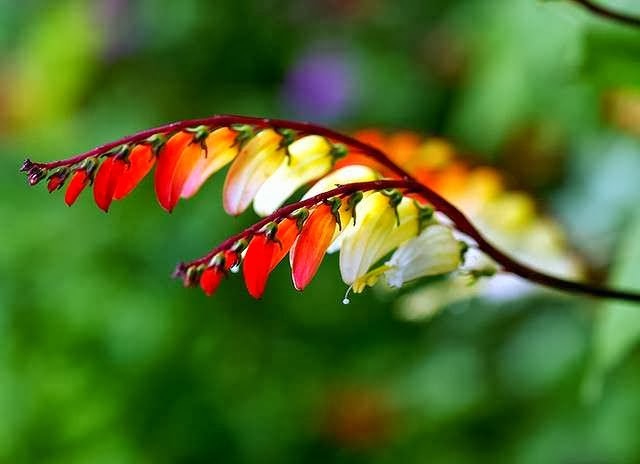 Mina lobata, commonly known as the 'Spanish Flag', is an easy-to-grow, ornamental climbing plant. Native to Brazil will require a sunny sheltered and warm site in rich, moist soil. The secret of growing all plants that come from South America is to provide plenty of warmth. Usually purchased as seed, it is classed as an annual in the United Kingdom although under more favourable conditions it would be considered a short-lived perennial. When growing from seed, they should not be sown until at least mid-April. This will ensure good germination and growth with onward temperatures reaching between 70-75F. Provide suitable support to tie itself into and, given the chance, will grow up to around 6 to 8 feet tall. It will perform in a sheltered sunny position but will also bloom well in the shade. Provide a moist but well-drained soil, but avoid rich soils and overfeeding with fertilizers high in nitrogen as foliage growth will be produced at the expense of flower. Its Brazilian origins mean that it will not survive outside in a northern European garden without a protective environment. With this in mind, if you wish to keep the same plant year after year consider growing it is a large container as Mina lobata does not like having its roots disturbed by lifting and re-potting. In these circumstances the plant will need to be moved to a greenhouse once the temperature starts to drop below 10 degrees Celsius. Over the winter, feeding can be stopped and watering will need to be reduced, however the compost around the roots must be constantly moist. It can be taken back outside once it has been hardened off in the spring.